← Had Enough 3DP “Gee-Whiz?” How About Some 3DP “Get Wizardry?”—Time To Go From Hype To How-To On The 3DP Power Curve! 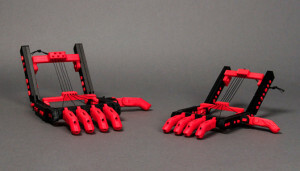 A Pair of Robohands, A Seminal Example of DIY/DIT 3DP-Driven “Good-Enough Tech” (GET). Thanks to MakerBot for the photo (these Robohands were made on a MakerBot printer). In this blog, we’ve regularly examined the world of more formal (sometimes called “classroom”) education around 3DP—the environment of STEM and STE(A)M. (I.e., Science, Technology, Engineering, Art/Design and Math.) Here we find classic pedagogy that spans the spectrum from as “Teaching The Teachers” to job training—all important initiatives and necessary parts of the total 3DP education mix. And, recently, we’ve looked at more informal learning structures in the DIY and DIT (Do-It-Together) spaces. Last post—for instance—we touched on the Maker Ethos and the Makers’ “platform” of spaces, places, clubs and other congregating and affiliating venues. So much universally useful is happening in the classroom that I think we should continue this discussion of 3DP Education—as a 3DP driver of how-to success—by revisiting one of my earlier posts on this topic. Last September, we ran a series of Roundtables—on important segments and sectors of 3DP—that we called “NY3DP Summits.” One of these Roundtables was entitled “3DP & Kids.” This is a Vlog with our embedded video record of the seminal eight-expert-plus-moderator discussion. The NY3DP Summits Roundtable In Which Digital-Discipline Teachers, Art/Tech Academics & Educational-Technology Players Examine Why, How & What “Students” Should Be 3D Printing & DigiFabbing—Whether Those Learners Are Children Or Adults. We entitled our third expert Roundtable—convoked on Wednesday, 25 September of our Summits‘ Week at the Elisabeth Irwin High School in Greenwich Village—”3DP & Kids.” Little Red School House & Elisabeth Irwin High School (LREI) were among the leaders of the progressive school movement in the City. As host of our Roundtable on this cutting-edge topic in Education Technology, LREI proves it is still expanding the boundaries of K-12 teaching. Other new and applicable terms of art in action here are “visual thinking,” “spatial reasoning” and Project-Based Learning. Education—about and in deployment of change—underpins 3DP and DigiFab empowerment of everything else this new technology touches. In putting this Roundtable together, 3DP Media enjoyed the professional help of two NYC educators who are steeped in the Ed-Tech sector—and leading the way in the educational practices around 3DP/DigiFab. These two are first Saber Khan, our event MC and Roundtable Moderator. He is also Technology Teacher and Curriculum Integrator at Little Red School House (LREI). My middle-school teacher (Oakland, CA) son-in-law Rowan Driscoll introduced me to Saber—they were formally colleagues in a summer-program around innovative teaching disciplines at UC Berkeley—in July. Saber enthusiastically supported—and added to—our “3DP & Kids” Roundtable concepts, helped recruit session participants and convinced LREI administrators to deploy resources and host our event at their Elisabeth Irwin High School. Our expert Roundtablers discussed moderated-questions, sparked and investigated other promising educational vectors, shared field-tested concepts and solution-developed with audience input. Come enjoy the compelling action via these links to our “3DP & Kids” videos: PART 1 and PART 2. Dynamite stuff for the K-12 classroom. AND, for any educational environment where knowledge, training, how-to—and inspiration!—needs imparting. Think startup entrepreneurs, ramping-up small-business owners, workforce-redevelopment participants and local economic development organizations and their already-aggregated communities of small-business constituents.